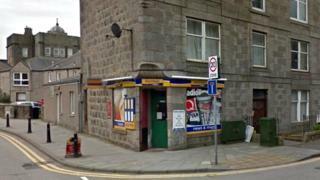 Three men have been charged following an alleged theft at a shop in Aberdeen while a worker was having a seizure. The incident happened at KeyStore Express in Summerfield Terrace on Wednesday. Police Scotland said the men, aged 45, 58 and 67, had been charged over what was described as an "extremely distressing incident". Appearances are expected at Aberdeen Sheriff Court later.